Handbags, purses, pocketbooks... modern conveniences? Not really. These useful items have served their owners for centuries. As far back as the medieval times, both men and women carried purses. Although these medieval bags infrequently held the rare commodity of money, they did serve to stash other small personal items such as important papers for men and sewing implements for ladies. These early purses often reflected the social status of the carrier. More elaborately embroidered and embellished bags usually found a home with society's most affluent members. Handbags dating prior to the 19th century rarely present themselves to collectors today. Some of the most popular bags with collectors these days are the beaded and metal mesh examples of the early 20th century. Beaded examples in excellent condition seem to be moving into the rare category now. As the materials become more fragile with age, restoration is often needed. This includes replacing torn silk linings and the tedious task of sewing tiny seed beads back into place. Expertly repaired bags do retain their value, but many are found with poorly executed restoration. Collectors should pay according to condition, reserving top dollar for only pristine beaded purse examples. Purses with a painted metal mesh made by Whiting & Davis and Mandalian in the 1920s and '30s often exhibit paint wear to the designs and sometimes have fringe dangles missing along the bottom edges. Links coming detached around the hinges can also present a problem. All these damage factors should be considered when making a purchase. Prices have risen sharply over the years in this market, with bags once considered fairly ordinary now selling for well over $100 each. Only bags in top condition garner high prices from devoted collectors, however. Metal mesh bags, especially the plain goldtone or silvertone versions produced by Whiting & Davis from the 1930s onward, are a little more durable than painted mesh bags but can still be scratched if not used and stored with care. Advantages to collecting these newer bags include being found in excellent to mint condition more often, and prices are still within reason unless you find a rare example. Condition concerns come into play with most any handbag from any era, even the Lucite box purses of the '50s, as shown above. These wonderful geometric bags made from hard plastic are durable, but not entirely indestructible. If not treated kindly, they are prone to cracking, scratching, and discoloration from spilled beauty products, even though they're made of plastic. For everyday functionality, shoppers wanting a vintage look that wears well should look for larger, more durable handbags dating from the 1940s, '50s, and '60s. These retro and vintage bags can add dramatic flair to a wardrobe without putting a sizable dent in your wallet. 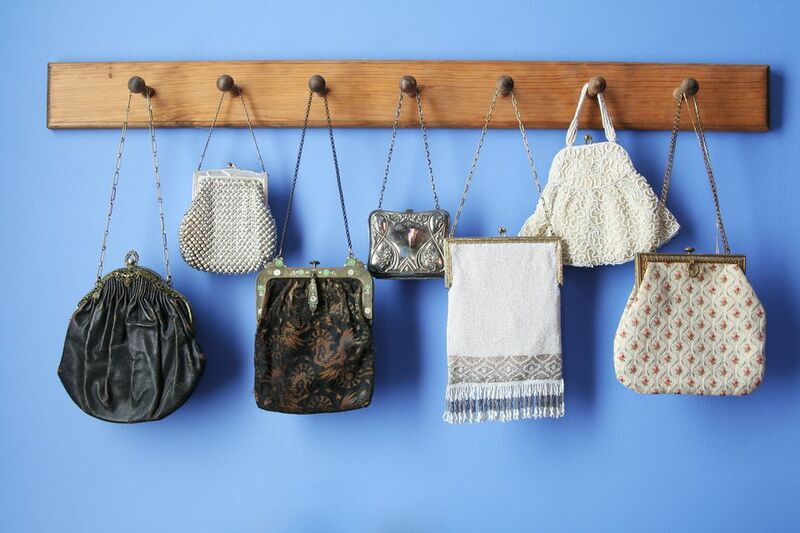 Collecting vintage handbags doesn't have to be an accessorizing proposition though. Many people use them to decorate as well. Older metal mesh and beaded bags look beautiful hung on walls in colorful groupings, and they don't have to be perfect to look pretty as wall art. Look for less-than-perfect examples at bargain prices for this purpose. A shelf lined with box purses from the 1950s also makes a stunning decorative statement, especially for those too young to remember these fanciful collectibles in their original glory. Some bags of yesteryear were made using whole baby alligators. The skins formed the bulk of the bag while the head and feet served as decorative accents. Placed as conversation pieces within a home, these unusual bags not only get some attention in most any setting, they may even stir a little controversy. Now that you're thinking vintage, it's time to clean out that closet and take another look at Aunt Edith's old handbag you saved. Perhaps it's just what you need to get a jump on your next wardrobe update or new decorating scheme.